South indian style vazhakkai podimas / varuval recipe. Steamed plantain tempered in a fragrant spicy coconut masala. Makes a great side dish for sambar or rasam. Plantain-vazhakkai is such a versatile vegetable that you can quickly whip up a curry, stir-fry, roast or even the quintessential south indian plantain chips. This recipe makes a podimas. 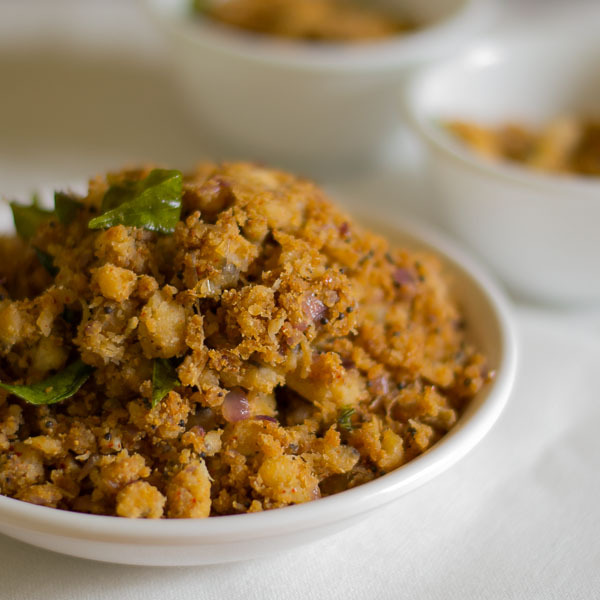 Podimas is a rustic mashed veggie that is tempered with indian spices. This podimas is rich and flavorful with coconut and spices. Plantain is lets say a blank canvas. It needs that oomph to make it stand out. I use a fragrant dry roasted spice powder to add more flavor to this otherwise boring veggie. I steam the plantains with the skin in a pressure cooker for 6-8 minutes (3 whistles). Then coarsely mash it and temper it with the spice masala. 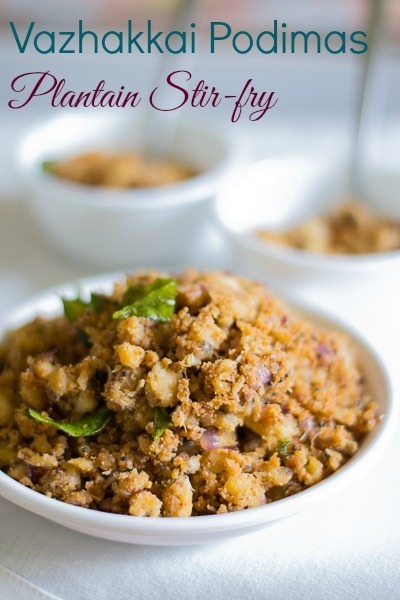 It makes a perfect side dish for a south indian lunch of sambar or rasam with rice. South indian style vazhakkai podimas/varuval recipe. Steamed plantain tempered in a fragrant spicy coconut masala. Makes a great side dish for sambar or rasam. Dry roast all the ingredients for the spice powder on a low flame until golden brown. Keep aside. Dry roast the coconut on a low flame until golden brown . Dry roasting on a low flame is important as the ingredients can turn from brown to burnt very fast. Keep aside. 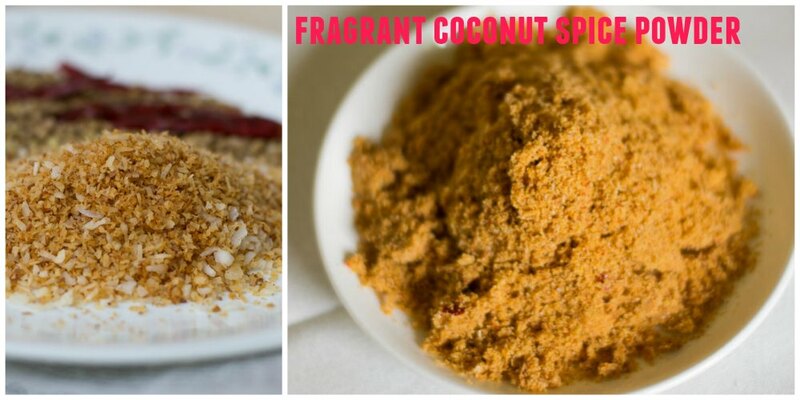 Grind the above roasted ingredients along with raw jaggery, tamarind and salt to a fine powder. Keep aside. Steam the plantains in a pressure cooker for 6-8 minutes. Peel and mash. Keep aside. Heat oil in a saute pan. 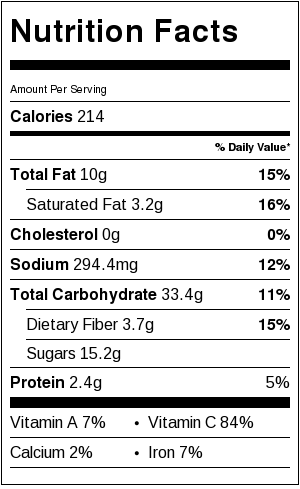 Add the mustard seeds and curry leaves. Let it splutter. Add in the chopped onions if using and fry till golden. Add in the plantains and the ground masala. Saute for another 5 minutes in low flame so the masala coats evenly. I am new to cooking and am not sure of how it tastes adding jaggery and tamarind together to a dish..Is it unavoidable or can u suggest any alternate to it? Superb dish. All of them in my family liked it. Thank you mam? Hi Mam thanks for the receipe tried today everybody at home liked it. Tried this today, came out amazing! Thanks so much!! Vanakkam. Made podimas and milagu rasam for lunch on a rainy day.vaditha saadham with a dollop of ghee as you say always…..don’t know how to describe deary…reminded of great poet Bharatidasan s words……”thindradhaye thindru thevitudhal illaamal andrandrum vaazhvil pudhumai kaanavendum….”. Please keep going. Best wishes.